Delonghi ECAM23.460 Coffee Machine Review - Our Verdict Is In! The Delonghi ECAM23.460 isn't perfect, but if you're looking for a versatile coffee machine that makes brilliant espresso and cappuccino then it's a great option. It's also versatile and has plenty of options for customising your coffee. Another great machine from Delonghi! 3.1 Is it suitable for commercial use? 3.2 Can you make a long black coffee? The Delonghi ECAM23.460 is a mid-range bean-to-cup coffee machine that’s designed to produce top-notch espresso and cappuccino from the comfort of your own home. It comes with features such as an automatic cappuccino function, digital display and various coffee customisation options. It’s also a popular coffee machine amongst those who want the “coffee shop” taste without spending a fortune. How does it perform though? Can it match pricier Delonghi coffee machines when it comes to taste and aroma? And is it worth the money? Keep reading our Delonghi ECAM23.460 review to find out. 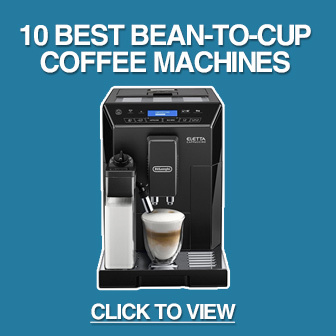 Note: Want to see our list of the best bean-to-cup coffee machines? Click here for our full list. The ECAM23.460 has an attractive and stylish design – at least in our opinion! The stainless steel exterior provides a timeless appeal that’s missing from many kitchen appliances. The front control panel also has a modern appearance, so the ECAM won’t look out of place in a contemporary kitchen. Speaking of the front panel, the digital display shows your current mode, while a dial and several buttons are used to customise your coffee (more on that in a moment). We like that the digital display shows the progress of your coffee, so you know (roughly) how long is left. The digital panel also makes the machine intuitive to use. The 1.7 litre water tank is located on the side of the machine. It slides out towards the front, which is useful if it’s placed by a wall. Be aware that the handle is built into the machine though, so if the right side is against a wall, you’ll need to leave a small gap for your hand. As is always the case with home bean-to-cup machines, we would have liked a bigger water tank. This isn’t a major issue, as it’s easy to refill, but makes the Delonghi slightly less convenient. The upside of the water tank size is that it’s a relatively compact machine. 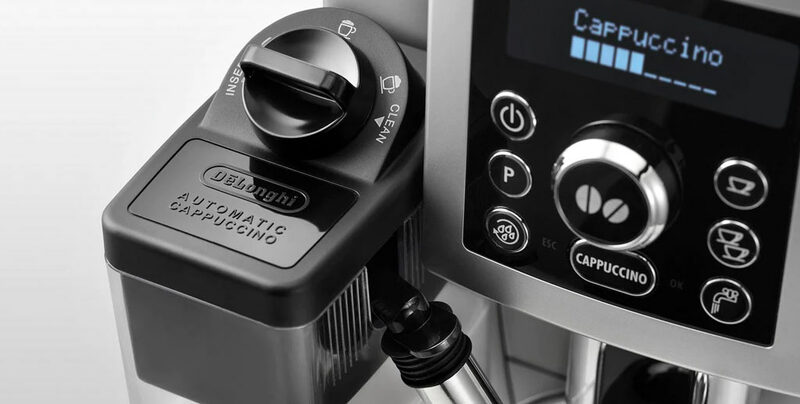 If you’re tight on kitchen worktop space, the Delonghi doesn’t need much room. Like the Eletta ECAM44.660, the ECAM23.460 includes a milk carafe for cappuccino and other milky coffees. This is stored in your fridge, but is attached to the left hand side of the machine. There are three options for foam quantity and the height of the milk nozzle can be adjusted to prevent splashing. To round out this section, Delonghi has included a cup warmer on top of the machine, which is great for making sure your coffee is still hot when you’re ready to drink it. There’s also the option for using pre-ground coffee and a setting for water hardness. The Delonghi ECAM23.460 has a variety of customisation options. These can be overwhelming if you’ve never used a bean-to-cup machine before, but once you get the hang of them the quality of coffee is outstanding. As with all bean-to-cup coffee machines, the conical grinder has several settings for coarseness (13 to be exact.) You can adjust this setting using a dial within the grinder. There are also a number of espresso settings. These include choosing between lungo or espresso, coffee quantity (6-15 grams), water quantity, water temperature and 1 or 2 cups. The most important factors when choosing a coffee machine are taste and aroma, and the Delonghi ECAM23.460 consistently produces lovely coffee. We think you would be hard pressed to tell the difference between the espresso produced by this machine and coffee sold by major high street brands. Despite the wide range of options, the machine makes it easy to get started. Simply add the beans to the container at the top of the machine, choose your desired coffee type, and let the ECAM do the rest. Of course, you’ll need to do some experimentation to get your perfect settings. But once you’ve found the right combination and saved them for future use, great tasting espresso is always just a few button presses away. The only downside is that coffee doesn’t always come out as hot as we like. It’s usually just about fine when making an espresso, but more of an issue when you add milk. The Delonghi also produces excellent cappuccino, latte and flat whites, so it’s more versatile than basic bean-to-cup coffee machines. Adding frothed milk to a long coffee is simply a matter of pressing the “Cappuccino” button once to start, and another to stop. You get a nice frothy texture to the drink, and you can add as much as you want. 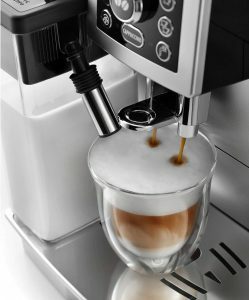 There’s also the option of preparing a latte macchiato, cappuccino or cafe latte with a single button press. This dispenses both the coffee and milk automatically, according to the settings you provide, and the results are brilliant. If you’re looking for a machine that can make both espresso and milky coffees with that “coffee shop” taste, the ECAM23.460 is a great option and well-worth the money. Again, if we have one complaint, it’s that coffees with lots of milk tend to come out lukewarm rather than hot. This is understandable, but if you like piping hot coffee you might need to put milky drinks in the microwave for a few seconds. The warm milk is also great for hot chocolate – although you’ll need to purchase the powder separately. There are two automatic cleaning programs: rinsing and descaling. Rinsing just pours water through the machine to clear out any let over debris, while the de-calcification program prevents limescale build-up. You’ll still need to do some manual maintenance though. In particular, the drip tray, milk carafe and coffee bin need extra attention. Removing the drip tray is quick and easy. It slides out from the front of the machine, and the silver cover can be lifted off to empty it into the sink. A handy feature is the float inside the drip tray, as this automatically cuts off the machine if there’s a chance of it overfilling. After each use of the milk carafe, the machine prompts you to switch it to “clean” mode. This dispenses water through the milk nozzle into the drip tray to keep it clean and ready to use for next time. While cleaning after each use won’t be problem when making the occasional cup, if you make coffee for the whole family the continuous prompting can be annoying. The coffee puck accumulates in a holder behind the water tank, but it can be accessed by pulling out the drip tray. You just need to empty this into the bin every so often, and give it a quick clean to prevent any build-up. Be prepared to replace the filter regularly if you make a lot of coffee though. The machine prompts you to descale and replace the filter every 100 cups. The 23.460 is a mid-range bean-to-cup coffee machine. It’s not the most expensive, but it costs more than many alternatives. How does it compare to other machines though? The ECAM 23.460 has many of the features of the pricier De’Longhi Eletta ECAM 44.660.B. These include the milk carafe and automatic cappuccino function. If you’re looking for a coffee maker that can make both espresso and cappuccino from whole beans, it’s one of the best options. Most importantly, it makes brilliant coffee every time and is easy to customise, so we think it provides value for money. It’s probably not the right option if you’re on a tight budget though. No. The ECAM23.460 is brilliant as a home machine – it’s one of the best for cappuccino, in fact – but it’s not designed to make commercial amounts of coffee. Can you make a long black coffee? Yes, there’s the option of adjusting between long and short coffee. 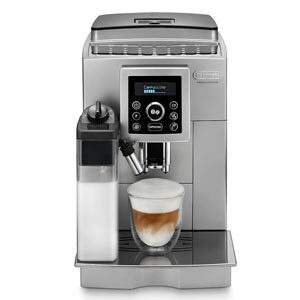 The Delonghi ECAM23.460 bean-to-cup coffee machine is an excellent model. It’s not cheap, and it can’t quite match the more expensive Delonghi Eletta ECAM44.660.B, but it produces brilliant espresso and cappuccino. It’s also highly versatile, so you can adjust your coffee to match your tastes.